First of all, apologies for the absence of the blog the last few days. As you’ll have gathered, we’ve had a major crash on the website—and while Margaret’s heroically managed to recover all but the last month’s blog posts we still don’t have any images for the rest of the site, and a few glitches remain. It’ll be a bit rough ‘n’ ready for the next week, so please bear with us. Normal service will be resumed as soon as possible. Anyway. Where was I? Oh, yes—the blog. Many thanks to everyone who downloaded a copy of my novel An Inquisition of Demons during the free promotion last week—just under 800, which isn’t bad at all—and for the positive reviews (3 on Amazon.co.uk, and Song’s on Amazon.com). I shall now slip back into well-merited obscurity until September, when the next one—the devastatingly brilliant The Bone Fire – comes out. In late-breaking gansey news, I’ve started the gussets, just over 14 inches up the body. 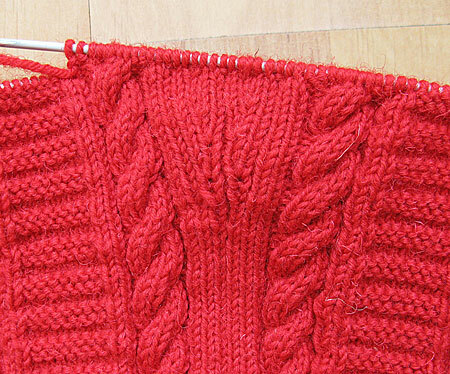 As I said last week, I’m going to let the seam stitch run up the centre of each gusset—always a neat effect. Perhaps the best way to explain this is with a chart, so I’ll post one here shortly. 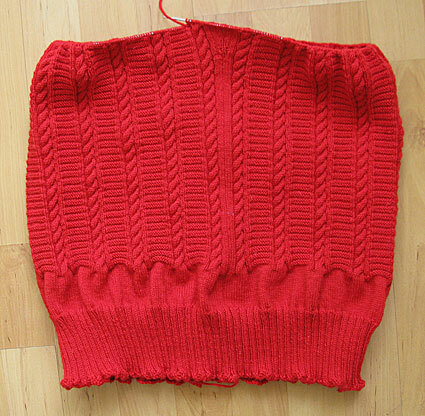 As ever, the first few rows of a gusset look pretty ugly, but it soon settles down. (I hope!) I’m going to keep these gussets small, just over 3 inches. Not sure if there’ll be a blog next week; partly because the Queen’s Jubilee is coming up, so I have to practice saluting the flags that fly proudly over our home – a Union Flag, and the Reid family crest (a weasel couchant cringing under a double cross); but also because Margaret’s sister Gail, who sometimes posts here, and her husband Bill are over here for a visit. We advised them to bring lots of warm clothes: as regular readers will know, the climate in Wick sometimes resembles the deck of a merchant vessel in heavy weather, lashed by wind and rain, and the only way to avoid being blown away on the way to the shops is to tie a line round your waist and put your trust in God. Well, wonderful to relate, the wind’s died down, the sun is out, the birds are making a bloody nuisance of themselves and it’s—well, it’s all rather gorgeous. Without the cloud layer it’s as if the scaffolding’s been taken down and you get to see the finished edifice entire at last, the sky goes all the way up to the Ionosphere, and may not stop even there. You can go for a walk at eleven at night without a torch. 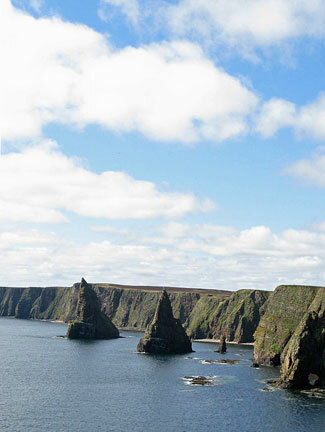 All over Caithness people are emerging blinking into the sunlight like earthquake survivors, a little bit stunned, trying to reconnect themselves with their landscape, not quite able to believe they’re alive, inheritors of a suddenly silent, windless world. I hope the family trip is fun and the gansey goes well. Great to see the site back – even if you are still working on it! And can we have a close-up of the gussets please when you can manage it? Hello all, and thanks. We wouldn’t have the last few days back again for anything! I see the pictures are up again now, too, so that’s a big relief. All we need to do now is reconstruct the last month’s blogs and the section about my writing and we’re away. Do you have all the photographs? I really enjoyed the book – the second time around for me, and this title is very fitting. As you may recall, I questioned the relativity of it’s first title, but most enjoyable is the flow of your words, Gordon. Gosh you had me worried, I have been lurking around the site for weeks marvelling at the patterns, buying the books and planning my own creation. I bought the wool and set forth on my first gansey, and then one fine morning after sneaking in a couple of rows in time I really didn’t have to spare I went to your blog. You weren’t there! I needed you, I needed to check your instructions. I wandered around the house bereft and hoping that you would soon return. Thank goodness you did. Hi again. Tamar, yes, we have a pretty full backup, and I’m happy to say the photos are back! We still have to reconstruct the last month’s blogs – we’ve got it all, it just needs to be reformatted – and then we’re back in business, and we can set about getting a new service provider, one with a help desk, or at least some concept of customer service (avoid Netweaver like the plague, guys). By the way, my email address @ganseys.com isn’t working again yet, so, again, if you email me directly it might take a few days to get a response, but as ever, please bear with us. Thank you, Lynne, that means a lot – and there’s still another 4 novels and a collection of short stories to be published, so watch this space! Chris, yes, sorry about that. I know we get over 150,000 hits a month now, so we were acutely aware that some people would be tuning in and not even seeing a holding message, just a “server not found” blank screen. Sunday through Tuesday were not good days, I can tell you! 150k hits a month, that’s impressive. Well done and welcome back. One, one day, I’ll start my gansey, meantime: washing up (again)!